Berries are tiny powerhouses that are known for its amazing health benefits. Blueberries are no exception. They are not only a perfect addition to your morning pancakes or oatmeal but are also a natural medicine alternative against serious diseases, including heart disease and cancer. Blueberries are plentiful in vitamin A, vitamin C, vitamin K, manganese, and dietary fiber. Plus they are low in calories and sugar. If your daily meal plan does not contain blueberries, it is time to correct it. Here are seven reasons to munch on blueberries on a daily basis. Chronic inflammation plays a vital role in how you feel, which is why including foods that have anti-inflammatory properties is a must. Blueberries are a great source of anthocyanins and flavonoids that help you manage inflammation and can even help you prevent it. By reducing inflammation, you lower your risk of developing heart disease and a number of serious health issues like arthritis. Shortly, blueberries keep your eyes healthy and prevent eye diseases such as cataract, macular degeneration, hypermetropia, and myopia. Flavonoids like resveritrol, rutin, and quercetin, carotenoids like zeaxanthin and lutein, vitamin A, vitamin C, vitamin E, zinc, selenium, and phosphorus found in blueberries are all good for your eye health. 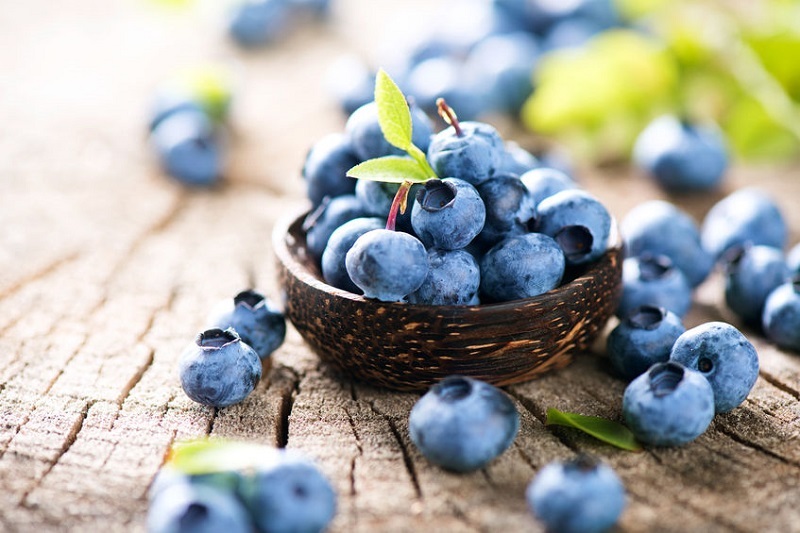 Due to their high antioxidant content, blueberries can be beneficial to your brain too. Research in the Annals of Neurology showed that women who eat great amounts of berries every day have a lower risk of developing cognitive decline by more than 2.5 years. When combined with nuts and eaten in moderation, blueberries will significantly boost your brainpower. If you suffer from constipation, adding blueberries to your daily eating plan may help you solve the situation. Blueberries are fortified with fiber that has been proven to prevent and relieve constipation. Alleviate the symptoms of constipation by snacking on a handful of blueberries and yogurt. The antioxidant, anthocyanins, found in blueberries is a powerful weapon against cancer. While the berries cannot cure cancer, it can help to stop the growth of cancer cells. It is one of the best reasons to munch on berries, including blueberries, every single day, isn’t it? With all the processed and fast foods available today, it is not easy to keep the digestive system healthy. And this is another reason to add a handful of blueberries to your daily diet. Blueberries are high in vitamins, minerals, fructose and acids that keep your digestion healthy. Consume them with kefir or yogurt to double the effect. Heart disease is the leading cause of death around the world. Whether it is because of high levels of stress, anxiety and depression or pollution and bad food, we, modern people, cannot avoid it. Incorporating more berries such as blueberries into your daily meal plan may help you keep your heart healthy and live longer. There are many other reasons to munch on blueberries every day. Moreover, there are tons of delicious ways to eat them. Add them to yogurt, smoothies, pies, fruit salads, and homemade ice cream, or eat them fresh to reap the best benefits they have. Despite their tiny size, blueberries can change the way you feel. Give them a try and let me know how you eat your handful of berries each day.